Planning meals for Atkins Induction phase 1 involves new ingredients and sometimes puzzling math. Give yourself a break from counting carbs with recipes – each with less than 1 net carb. If you’re close to your total carb count and feeling hungry, or saving carbs for another meal, these are your go-to recipes: crepes, spiced meats and crunchy crusts – all made from foods with almost no carbs. Put down the carb counter, forget your worries and slip into the kitchen. The Atkins Phase 1 recipes below have an added bonus. These main meals are extremely filling. 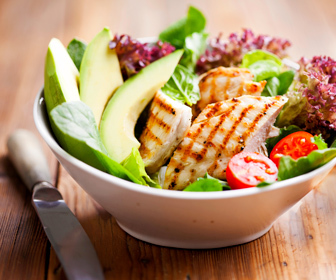 They are high in healthy fat, with moderate protein and almost no carbs per serving. .75 net carbs per serving for 4 servings. Beef, veggies, melted cheese and bacon inside a crispy crepe crust. The net carb totals for this recipe include the crepes. Click the 1 carb recipe to print or save. 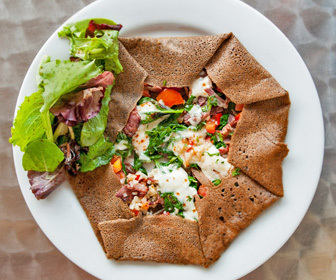 These crepes create the crust and have almost no carbs. They are excellent plain, stuffed or slathered in butter. Click the no carb recipe to print or save. .25 net carbs per serving for 4 servings. 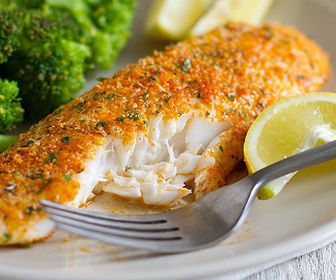 Flaky white Tilapia and a crunchy, no carb crust with a kick. Homemade Adobo spice keeps this recipe almost no carb. .5 net carbs per serving for 4 servings. 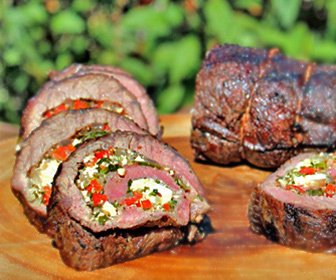 Crumbled feta cools down fresh cilantro and jalapeno peppers, wrapped in juicy layers of steak. Stores well in the fridge, delicious hot or cold. .4 net carbs per serving for 4 servings. 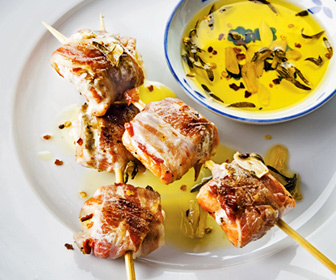 Savory and citrus flavors of pressed garlic, onion, parsley and lime over grilled Mahi Mahi kebabs. Dip in infused olive oil. .07 net carbs per serving for 10 servings. A crunchier version of chicken breast tenders made with grated Parmesan, sharp cheddar and basil – not pork rinds. Tilapia steak grilled with rosemary and lemon, then topped with a rich garlic butter sauce. Fast-rub your chops with unexpected coriander and cinnamon. No marinating and grills in 20 minutes flat. .03 net carbs per serving for 4 servings. Freshen up broiled salmon bites with a tangy vinaigrette. Add crunch with crumbled bacon. .1 net carb per serving for 8 servings. Richly spiced London Broil with garlic, oregano, parsley and bay leaf. Stores well in the fridge for snacks during the week. .8 net carbs per serving for 2 servings. Thick broiled salmon fillets with lemon and garlic, drenched in balsamic infused olive oil sauce. Click the recipe to print or save. Grab all 11 Atkins Induction phase 1 recipes from this article in one easy eBook: 1 Carb Main Meals for Induction.